“Walmart, Nordstrom, Macy’s, Staples, Whole Foods and many others have felt the impact of disruptive changes from online competition and new business models,” Lampert wrote. Walmart is expecting flat sales this year and announced last month that it would close 269 stores, including all 102 of the company’s smallest-format stores, called Walmart Express. Macy’s, Staples, Nordstrom, and Whole Foods are also all suffering from weak or declining sales and closing stores to cut costs while investing more in ecommerce. Lampert also noted that department stores and apparel retailers have been hit hard by an unseasonably warm winter that has led to declines in sales of winter apparel. Lampert says Sears is trying to adapt to the evolving industry, and acknowledged that the company is falling behind the pace of change. Sears said Thursday that its same-store sales fell 7.1% in the fourth quarter and revenue dropped 9.8% to $7.3 billion. The company lost $580 million, or $5.44 per share, in the quarter compared with a loss of $159 million, or $1.50 a share, for the same period last year. 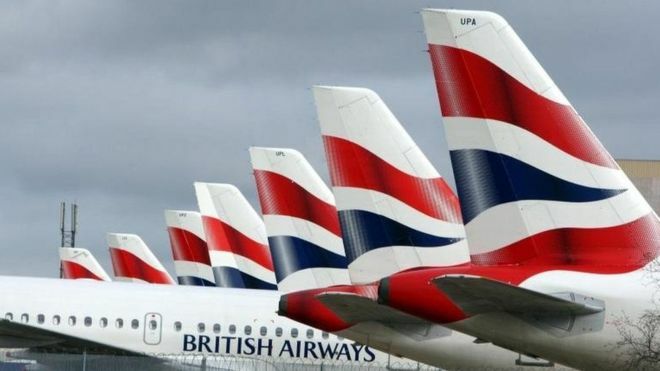 British Airways and Iberia’s parent company IAG reported a 64% rise in yearly pre-tax profits to €1.8bn (£1.4bn), helped in part by lower fuel prices. Fuel costs for the year were down 6.3%, and would have been 17.2% lower, but for a rise in the value of the dollar. IAG reports figures in euros but buys its fuel in dollars. Over the year the euro fell in value against the dollar. IAG said it had “undoubtedly been a good year”. However, it added it had also been challenging because of the big movements in the currency and fuel markets and that “the benefits gained from lower fuel prices have been partially offset by the stronger US dollar”. The price of oil has dropped around 50% over the year. IAG, whose airlines also include Vueling and Aer Lingus, said it was expecting next year’s full-year profit to show similar growth to this year’s. The company said it was on course to make an operating profit of €3.2bn next year. A number of top 100 UK company heads have been giving their views this week as to whether or not the UK should stay in the European Union. Willie Walsh, IAG’s chief executive told the BBC he didn’t think it would make much difference one way or the other to his business: “We’ve undertaken a risk analysis and we don’t believe a vote will have a material impact on our business.” He also repeated his previous view on the chances of a third runway at Heathrow, saying he did not think one would be built because the government continued to delay decision making. 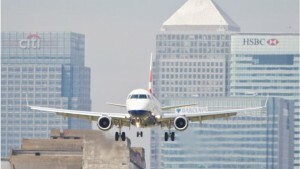 London City Airport has been bought by a consortium led by a major Canadian pension fund. The price paid has not been disclosed, but the airport’s value has been put at about £2bn. 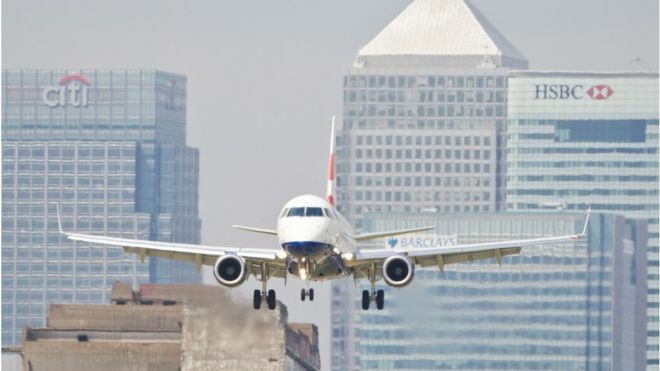 City Airport, which is near Canary Wharf in London’s Docklands, is popular with bankers and City professionals because of its proximity and its small size. Last year, a record 4.3 million passengers used the airport. The deal involves Alberta Investment Management Corporation, and investment funds the Ontario Teachers’ Pension Plan and Wren House, part of the Kuwait Investment Authority. They already own a string of airports, including Belfast International Airport, Birmingham Airport, Bristol Airport, Brussels Airport and Copenhagen Airport. They described London City as “a highly attractive infrastructure investment in the UK. The airport represents a unique opportunity to invest in an integral part of the London airport system and offers a service proposition based around location, convenience, speed and customer service”. It promised to increase the number of routes it flies and said it would have a “positive economic impact for all of London and the local community, in particular”. London City was last bought in 2006 by Global Infrastructure Partners, when it carried two million passengers a year. The London market opened higher, adding to Thursday’s gains, but shares in RBS sank 8% after it reported another annual loss. After jumping 2.5% in the previous session, the FTSE 100 was up 63.65 points, or 1.1%, at 6,076.46. Mining shares bolstered the index, with Glencore, Rio Tinto and BHP Billiton all up by more than 2%. But shares in Royal Bank of Scotland dropped 8% to 224.6p after the bank reported its eighth year of losses. RBS reported a loss of £1.98bn for 2015, partly due to putting aside £3.6bn for litigation costs.Stripping out one-off costs, RBS recorded a £4.4bn underlying profit, although this was down from £6bn a year earlier. On the currency markets, the pound rose 0.2% against the dollar to $1.3993, and also climbed 0.2% against the euro to €1.2689. UK economic growth in the last three months of 2015 has been confirmed at 0.5%, figures show, supported by steady growth in the services sector. The Office for National Statistics’ (ONS) second estimate of GDP growth for the quarter was unrevised. The growth estimate for 2015 was also unchanged at 2.2%, which was the slowest annual pace since 2012. However, the UK economy remains one of the fastest growing of the developed nations. Output in UK’s services sector grew 0.7% in the three months to the end of December. Household spending slowed slightly in the quarter, but still rose by 0.7%. However, the production sector and net trade dragged on growth in the final three months of 2015. Production output, which includes heavy industry, energy and manufacturing, contracted by 0.5% in the fourth quarter compared with the previous three months. Vicky Redwood, economist at Capital Economics, warned “the recovery remains entirely dependent on consumer spending”. Last month, Chancellor George Osborne warned that the economy was facing a “dangerous cocktail” of risks in 2016, ranging from slowing global economic growth to volatile stock markets and the continuing slump in oil prices. On Wednesday, the International Monetary Fund (IMF) said the UK economy’s recent performance had been “strong”, but added that the referendum on EU membership was a “risk and uncertainty”. The IMF also said that the global economy had weakened further and warned it was “highly vulnerable to adverse shocks”. It said the weakening had come “amid increasing financial turbulence and falling asset prices”. The IMF’s report comes before the meeting of G20 finance ministers and central bank governors in Shanghai later this week. It said China’s slowdown was adding to global economic growth concerns. China’s economy, the second-biggest in the world, is growing at the slowest rate in 25 years. “Growth in advanced economies is modest already under the baseline, as low demand in some countries and a broad-based weakening of potential growth continue to hold back the recovery,” the Washington-based IMF said. Air passenger duty (APD) for children aged over 12 and under 16 on economy flights will be abolished from 1 March. Chancellor George Osborne announced the changes in his Autumn Statement of 2014. Those who had already booked flights will have the tax refunded – but there are differences in the way airlines are dealing with those payments. APD was abolished for the under 12s from 1 May last year, bringing a programme of refunds from airlines. Air passenger duty is charged on all passenger flights from UK airports. The rate of tax varies according to where the passenger is going, and the class of travel, starting at about £13 for short-haul flights to Europe. If you want to raise your company’s online profile and attract more internet based custom why not consider contacting Direct Submit to find out how they can help you create an internet marketing strategy that is completely suited to your company’s needs? With a great range of strategies on offer that really produce results including Pay per click, Google Adwords and SEO optimisation you may be surprised at how much Direct Submit can do to help your business succeed online. No matter what type of company or business you run at Direct Submit you can be sure that they will be able to help you choose the best course of action for your personal marketing campaign and will fully explain all the available options and how they could benefit your business. By using methods such as Pay per Click, where your advert will be featured in the ads on search engine results pages but you will only have to pay each time someone actually clicks through to view your full website, they will make sure that your page gets noticed and taht you received far more directed traffic. Whether yours is an established business with a website in need of more traffic or you’re just now venturing into cyberspace, Direct Submit will develop the ideal SEO marketing campaign to bring in new clients so that you can focus on the core business while watching revenues soar. We provide a diverse range of Pay per Click services, SEO and other Internet marketing strategies for UK businesses both large and small – at affordable costs. No matter your advertising budget, we will work with you to develop a campaign to help your clients find you right when they need you. To learn more about how we can help you maximise your Pay per Click campaign, call us today on 0845 272 2350 or visit our Internet Marketing Services website today. If you are looking for a prom dress within the Newcastle and Sunderland area it’s definitely worth taking a look at the fantastic range of beautiful and unique prom dresses at Just The Way You Are. Whether you are looking for a dress for a high school prom, graduation or a different formal occasion, with so many different high quality prom dresses available in a wide range of stunning designs you can be certain that you will find the perfect prom gown for you, no matter what kind of image you are trying to create. As Just the Way You Are is predominately a wedding boutique many of the prom gowns available would also be suitable for wear for a bridesmaid and they also have a great range of accessories available to complement any formal dress perfectly so you can complete your look without having to go anywhere else. With designs including full length flowing prom gowns, figure hugging prom dress, plain and patterned dresses and some with added glitter and sparkles you are sure to be impressed with the wide range available, and with a wide range of sizes available up to a 32 you can be sure no matter what your shape or size you will be able to find a prom dress that flatters your figure and looks fabulous. Why not take advantage of the great experience shopping at Just the Way You Are offers? With the opportunity to book a private appointment so you can visit the boutique based in Newcastle with a few friends or family members and have the chance to spend two hours browsing the range without distraction from any other shoppers. A friendly member of the team will be on hand at all times to offer you advice and feedback while you try on prom dresses from the wide selection on offer, after your initial consultation where you can explain what you are looking for and discuss your sizing, your advisor that day will be happy to find you a selection of prom dresses based on your ideas to try and then present you with more options based on your feedback until you have found your ideal prom gown. With all dresses available being supplied from carefully selected designers you can be sure that no matter what prom dress you may choose all dresses supplied by Just the Way Your Are, are well made and always use the best standard of materials possible so you can be sure that it will be really good quality and look great. If you really want to make an impact with so many unique and usual designs in such a wide variety of sizes and cuts you can be sure to find a prom dress that fits in all the right places and really turns heads. As a successful wedding boutique you can be sure that their expert team have the skills and experience required to help people find the perfect dress that looks amazing every single time, no matter what the occasion may be. So if you are based in the Newcastle or Sunderland area and want to find the perfect prom gown for any formal occasion it’s definitely worth making an appointment to visit Just The Way You Are at their beautiful boutique, with a wide choice of dresses and other accessories, excellent customer service and an excellent range of sizes available you can be sure you won’t be disappointed. For more information or to arrange a visit and consultation about finding the perfect prom dress or gown in the North East for you, visit the Just the Way You Are website today or call us on 0191 261 0778 to make an appointment. You won’t be disappointed. Rules on Sunday opening hours for shops in England and Wales are out of date and need to be relaxed, a group of 200 MPs and council leaders has said. In a letter to the Sunday Telegraph, they wrote that increasing spending on Sundays would boost job prospects and help shops compete with online firms. They backed government plans to devolve Sunday trading laws to local councils. However, the shopworkers’ union said the majority of its members opposed extended Sunday trading hours. In the letter, the group – which includes the cross-party British Infrastructure Group (BIG) of MPs – said the world had changed “a great deal” since Sunday trading laws were last updated in 1994. In England and Wales, shops over 280 sq m, or 3,000 sq ft, in size can open their doors for only six consecutive hours between 10:00 and 18:00. Retailers can be fined up to £50,000 if they break the rules. There are no trading restrictions in Scotland, while in Northern Ireland shops can open for up to five hours between 13:00 and 18:00. The letter supported a report by the BIG, which backs the modernisation of “outdated retail law”. The group includes more than 40 MPs and is led by former Conservative Party chairman Grant Shapps. Its report argued the trend across Europe is for “liberalising” Sunday trading laws, saying that changes on the continent resulted in a 7-9% net increase in employment. Campaigners opposed to longer opening hours question if the move would really benefit the High Street, pointing out that under the existing law, smaller traders are allowed to open for longer. Last year, Chancellor George Osborne promised that councils and mayors would get the power to set Sunday trading laws in their areas. Business Secretary Sajid Javid earlier this month said ministers plan to press ahead with the proposal, saying the move would allow local authorities to “help struggling high streets”. However, it faces strong opposition in the Commons. And retail union, Usdaw, has said the current trading hours give “everyone a little bit of what they want. Retailers can trade, customers can shop, staff can work; whilst Sunday remains a special day, different to other days, and shop workers can spend some time with their family,” general secretary John Hannett said. The pound is heading for its biggest drop in nearly seven years against the dollar amid uncertainty about a possible British exit from the EU. At one stage it was down 2.1% at $1.41020, the biggest one-day drop since March 2009. The move follows London Mayor Boris Johnson joining the campaign to leave the EU after Prime Minister David Cameron set a June referendum date. The steep fall adds to losses made by the pound over recent months. So far this year, fears of a British exit from the EU – dubbed ‘Brexit’ – have already pushed the pound down by more than 4% against the US dollar. Analysts said that was likely to continue to direct sentiment until the vote. “Today’s weakness appears to reflect an increased probability of Brexit after political reaction to the new deal on EU membership was more split than the PM would have hoped,” said Sam Hill, senior UK economist at RBC Capital Markets. If the pound finishes at its lows for the day, it will be the biggest one-day loss since the Bank of England cut interest rates to 0.5% in 2009 and started its economic stimulus programme known as quantitative easing. Against the euro, the pound is down 1.2% to €1.2774. Against the yen, the pound has slumped to 160.075 yen, its lowest since late 2013. “I don’t think investors are saying Brexit is good or bad, but it’s the uncertainty,” said Simon Smith, chief economist at FxPro. The pound has already dropped more than 17% against the dollar in the last 18 months, partly due to the outlook for UK interest rates. Whereas the US raised rates last year, Bank of England governor Mark Carney has ruled out such a rise for now. As a result sterling is seen as less attractive for investors, continuing to fall from the $1.7165 peak seen on 1 July, 2014. A weak pound helps exporters by making British goods cheaper on international markets. It also makes the UK a better value destination for tourists. However, a weaker pound makes imports more expensive, possibly hurting consumers and businesses that rely on foreign goods. David Cameron announced on Saturday that the EU referendum would be held on 23 June after he came back from Brussels with a renegotiation of Britain’s EU membership. According to Mr Smith, the pound went “up the escalators” on Friday and “down the lift-shaft at the start of the Asia session” after the weekend’s events. The intervention by Boris Johnson is being seen as a significant blow to Mr Cameron’s campaign to remain in the EU. Several other senior Conservatives – including Justice Secretary Michael Gove – have already said they would join the Out campaign.